The Floor Lamp is a very versatile light fixture that you can use in many different rooms in your house. The light fixture comes in an assortment of styles and finishes, and stands 58 to about 64 inches high, with a base that takes up only about eleven inches of floor space. The floor lamp is a decorating element that you can easily places in spaces where large end tables or chests would take up too much room, if they were used as stands for table lamps. Illustration 1 answers the question “Can you put a floor lamp next to a sofa“? The answer is Yes you can. The main thing, when placing an end table with a lamp on it on one side of the sofa, and a floor lamp on the other side, is to make sure the top edges of both kinds of light fixtures shades line up with each other. You want the eye to move horizontal from the top of one shade to the other, without any dropping down or moving upward. Illustration 2 shows how preferable two matched floor lamps flank a sofa. When space is limited this is a nice way to fit in lighting along side a couch. 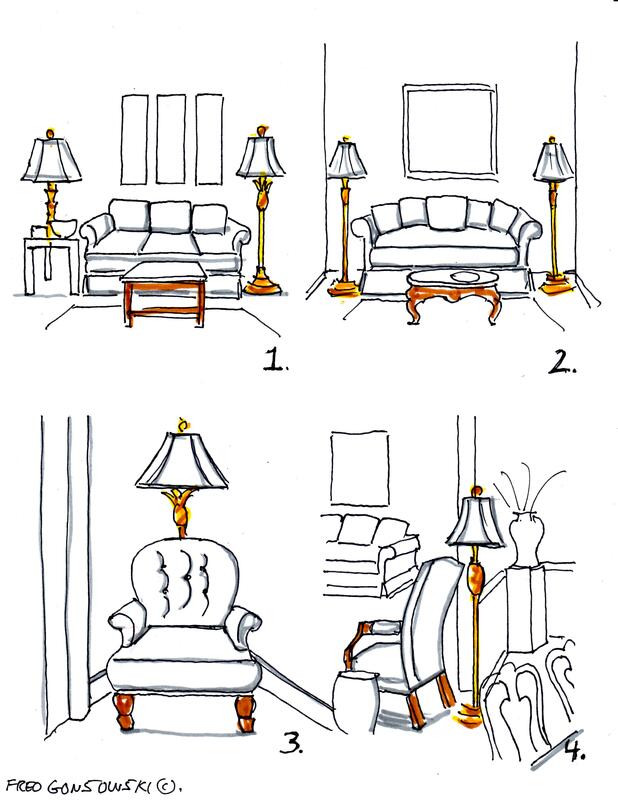 Illustration 3 shows a floor lamp behind an upholstered chair, which is cutting off the corner of a room. The lamp provides reading light, and illumination to what could be a dark spot in the room. Illustration 4 depicts an upholstered chair that is placed in a spot between two rooms. The floor lamp lights both the living room space and the dining room (I’ve done this in my own house). 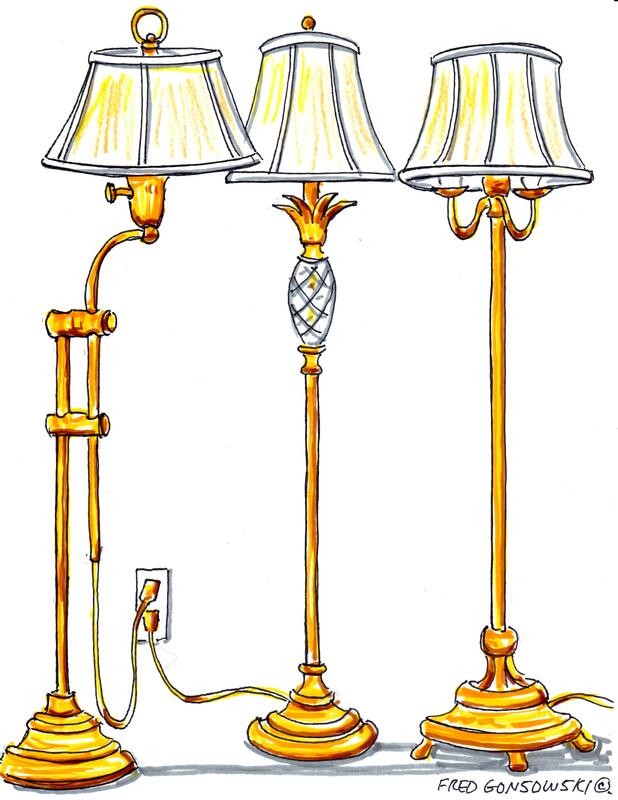 Illustration 5 shows two floor lamps flanking a fireplace. The lamps not only illuminate the space, but add vertical tension (suggest height) in a room that has horizontal format furniture (wider than tall). 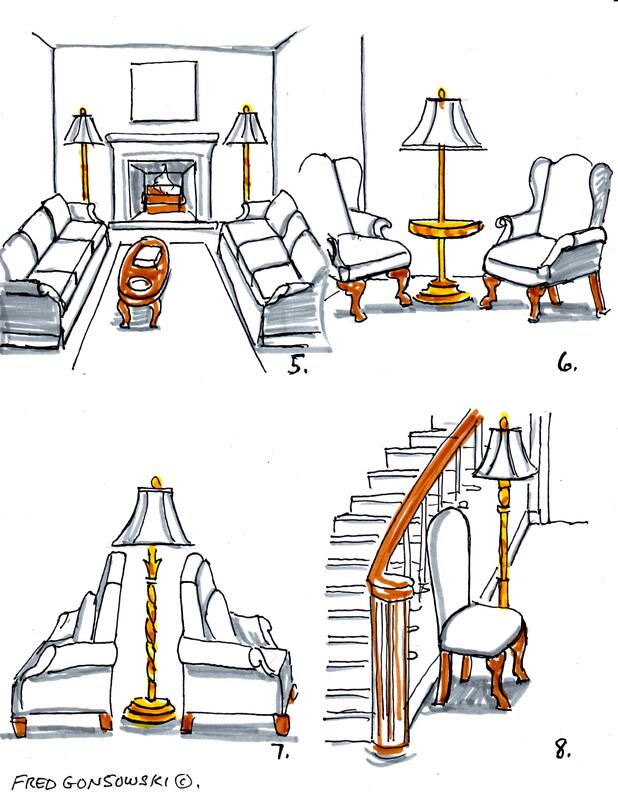 Illustration 6 portrays two wing chairs that are placed along side a floor lamp with a built-in tray-top. This style of floor lamp is perfect for when you have limited space, and the golden-brass tones of the table will pick up the color of other golden-brass metals used in the room (door knobs, chest pulls and knobs, decorative metal objects, etc). Illustration 7 shows two sofas placed back-to-back with a pair of floor lamps placed between them. Illustration 8 depicts a floor lamp and chair used in a front hall. The chair is perfect for sitting down and putting on over shoes, and the floor lamp is a welcome light left on during the evening. Illustration 9 would be perfect in an upstairs hall, corner of a dining room, or even in a living room. The floor lamp counterbalances the side chair, and helps to add vertical tension to the furniture grouping. Illustration 10 shows a horizontal format (wider than tall) blanket/hope chest in a hall area. The floor lamp fills in the corner of the room, adds vertical tension to the space (directs your eyes upward, as does the wood work on the door frame and vertical window moldings), and adds needed light. Illustration 11 depicts a bed with two floor lamps flanking it. If a bedroom is small and there is not much / no space for bed side tables, this is an option to consider. 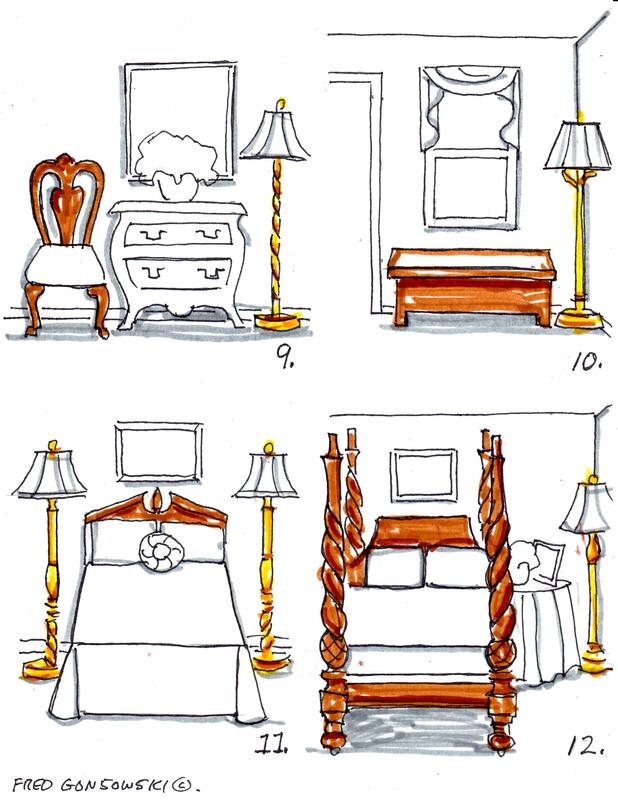 Illustration 12 shows a 4 poster bed with a skirted table next to it. The skirted table has many of the owners cherished possessions on it. The floor lamp is just to its right. Who says a bed-side table has to have a lamp on it. So there you have it, twelve illustrations of different places where I think you can use a floor lamp in your house. I hope they inspired you. If you come up with any other places to locate a floor lamp, all the readers of this post and I would love to hear your suggestion, leave a comment. This entry was posted in Interior Decorating Principles, Lighting. Bookmark the permalink. 16 Responses to The answer to …”Can you put a Floor Lamp next to a Sofa”? I found your blog on Pinterest. I love your illustrations and informative posts. Thank you for taking time to share your experience and knowledge of gardening and interior design. Your illustrations and explanations make the basics of design much easier to understand. Do you have a book? Your gardens are so beautiful too. Hi there Debbie S.C, thanks for your comment. Maybe some day, someone in the publishing business will see my blog and ask me to write a book for them. Until that happens, people will have to find out about the principles of design by reading the posts that I’ve written so far. Happy Summer to you. I know this post is old, but I just found it and it was really helpful, thanks! Hi there Lissa, old or new, if a topic is of interest it does not matter when it is/was written, as long as it inspires the reader. Thanks for your comment. Hello, I have a large living room with no hardwired lighting. We bought multi head floor lamp and placed it between the couch and an adjacent chair. I found a different multi head floor lamp that I adore, but doesn’t cast as much light. I’m tempted to purchase it and use in the same room but on a different wall, with a chair and bookshelves. I’m concerned a bit as they don’t match and both have three light heads. Thoughts? What a terrific site. Clear advice and charming illustrations. I stumbled upon it looking for some furniture arrangement advice and now I’m tempted to read through every page. Thank you for sharing your expertise, Mr. Gonsowski. Hi there Grace, look at the right side of your screen and you will see Categories. Under it is Interior Decorating Principles. All of my decorating posts are there. At the end of the page click on the word more and you will keep going through the different topics that I’ve written on. So far I’ve had over two million of my articles read by over a million people who have come across my site. I hope I, in some way, have inspired them all. Thanks for your comment ;-}. This site is wonderful! I learn so much. What a great blog! I especially love your illustrations! I was scouring the web to find an answer to a lighting design question that I have, and you seem to provide the most comprehensive information. Still, I am unclear of the following, is it okay to flank a tv stand that is flush against the wall with a floor lamp on each side of it? For example, just picture the sofa in illustration #2 as a tv stand instead of the sofa. Would this work? I just feel like the wall by the tv stand would be too bare without the floor lamps to add some visual interest. The opposite side where the sofa rests will have a magazine rack next to it, and a basket that will hold blankets and throws. I might put a small table there too with a single lamp. That said, I don’t think this side of the wall would need the floor lamps. It would be too congested. Hi there JK, my first thoughts about putting floor lamps next to your TV stand would be “no” as the light being along side the TV might be it too bright for you to look at while watching the TV. My second thought was, if you want the floor lamps go for them, “but” have floor lamps shades in a dark or non light emitted color, so no light comes from the sides of the shades, just from the tops and bottoms; your light will be sent up toward the ceiling and down toward the floor. If you have floor lamps now, in some other part of your house, put them there (along side the TV) to see how they look, turn on the lights and TV and then see how it all looks together and how the lighting is. After that take two hand towels and lay them over the fronts of the shades to block the light from the sides of the shades, in one second you will know if the lights work or not. Good luck with your project. Such great advice, thanks so much Fred! I just purchased a floor lamp for behind my curved sectional and it is not tall enough. Would it be ok to place the lamp on a small stand to give it more height? Hi there Patti, as long as the stand is sturdy and the lamp is not wobbley, I would say go for it. Just make sure the stand is sightly if it is view-able by people who are in your room. If you have a moment also read my post titled The Right height of table lamp for your End Table. If you have other light fixtures in the room you would want to keep things matched for height.